For the last few years, February has been my month of chocolate. All chocolate, all the time with an occasional exception for Chinese New Year, the Olympics and Super Bowl snacks. It seems appropriate that February = chocolate. They just go together. To open the Month of Chocolate this year I wanted to start with Mexican chocolate, those discs of chocolate, cinnamon, sugar and ground almonds that seem to accumulate in my cupboards. I’ve been shifting one of the stupid octogon shaped boxes around far too much lately; it was time to do something with it. The last time it fell on my head, was the last. I just left it on the counter as a reminder to use it ASAP. The 56th time I looked at it sitting there, I realized I had to transform this damn box into something delicious. In a moment of clarity, I thought cookies. 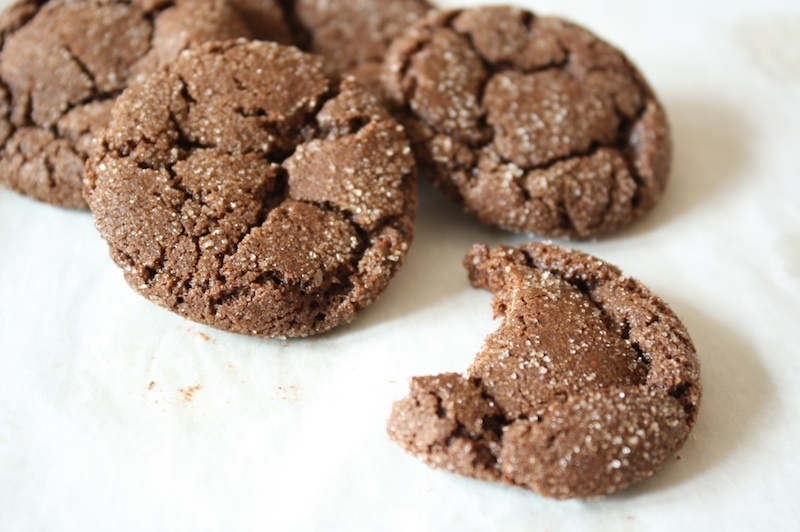 My favorite chocolate cookie recipe could be made even better with a few Mexican inspired adjustments. I was off to the races. 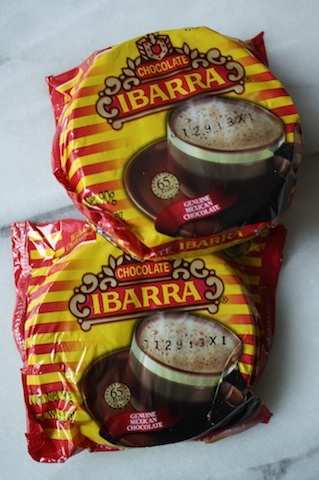 The grocery store variety Mexican Chocolate is ready available in the Hispanic aisles with Abuelita and Ibarra the most common in these parts. It makes an outstanding hot chocolate and on a cold day, there isn’t much better. Dipping a similarly spiced cookie into that hot chocolate was definitely worth exploring. 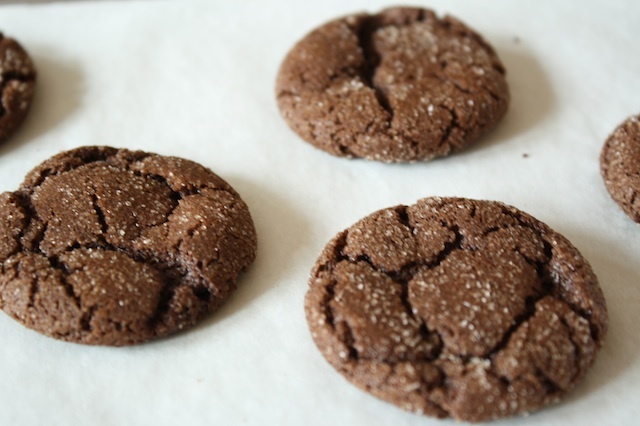 The chocolate, diced fine, with a little extra cinnamon and cayenne makes one addictive cookie. The key to this recipe is getting that texture correct: crispy on the outside, chewy within. This is my standard definition of a perfect cookie texture. To get it like that, the dough needs to go into the oven cold and they have to be pulled at just the right moment. Play around with timing and oven temp until you get it just right. It’ll make a difference. STRESS THERAPY BAKING FACTOR: HIGHLY ADDICTIVE. There’s something about these cookies. You have the best intention to eat just two and then … they’re gone. I can’t quite explain it other than they’re quite delicious. That texture, the difficult to achieve crispy/chewy combination is undeniable. 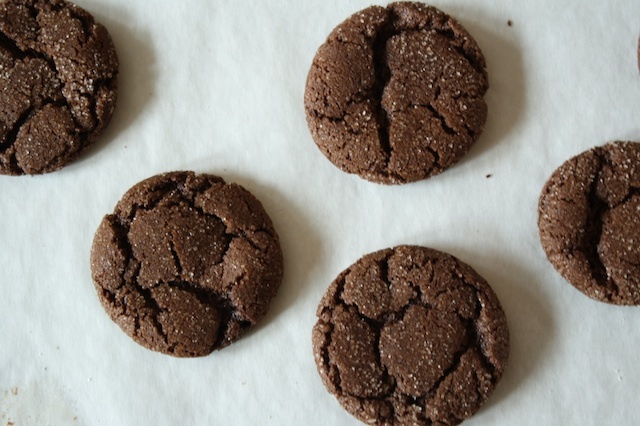 Make a big batch of Mexican hot chocolate and a batch of these cookies and sit back and smile. Let the chocolate cool slightly while you sift together the flour, cocoa powder, cinnamon, baking soda, salt and cayenne in a medium bowl. Set aside. Reduce speed to low; gradually mix in flour/cocoa mixture and stir on low until just combined. Transfer the dough to a sheet of plastic wrap and wrap tightly. Refrigerate until well chilled – at least two hours, overnight or a few days. Combine the sugar and cinnamon in a small bowl. Roll each dough ball in the cinnamon sugar and place onthe prepared sheet pans, about 1- ½” apart. Bake 10-12 minutes, switching rack position halfway through. The cookies should be just barely set to the touch, crunchy on the outside but still soft and chewy in the center. Adjust baking time if necessary. Let cool and store tightly wrapped. Cookies will keep for a few days, tightly wrapped.